...Or maybe you’ve started to scratch the surface, and you’re ready to go deeper. Great! You’re exactly who we’re here to help. We’ve created this guide to lead you into the world of PBL one step at a time. Okay, full disclosure here: Project Based Learning isn’t an approach you master in a matter of weeks, or even months. It’s a journey that unfolds year over year, as you develop your practice, learn alongside your students, and grow with experience. If you’ve already read a bit about Project Based Learning and you still have questions, you’re not alone. Ask anyone who’s successful with PBL, and they’ll probably tell you that the ideal way to get into it is through an immersive multi-day workshop. After training more than 80,000 educators this way, PBLWorks is known for providing the perfect first step into the world of PBL. Our workshops give you a sense of what PBL looks and feels like, and you’ll come away ready to implement a project in your classroom. 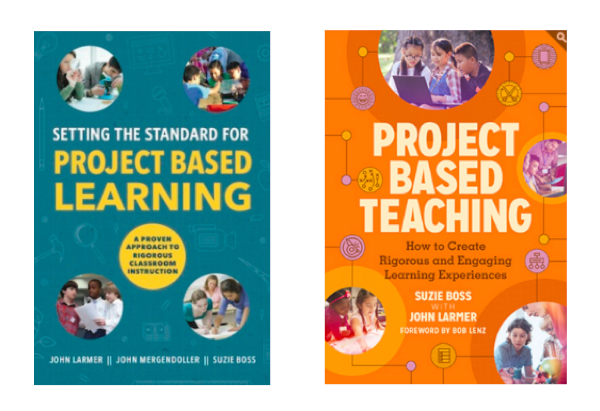 If you just want to dip your toes in the PBL pool for now, pick up a good book on the subject. Here’s our recommended reading list. Ready to go bigger? Bring us to your school or district. For a more personalized group experience, PBLWorks can schedule an immersive multi-day PBL workshop exclusively for you and your colleagues, onsite at your location. This approach will jumpstart Project Based Learning at your school or district, for the most powerful immediate impact. Want to see how Project Based Learning works, from launch through final public presentations? Watch one of these 7- to 10-minute long videos. Shot in six classrooms across the U.S., these videos show PBL in action, with students in grades K-12 immersed in math, chemistry, history, ELA, and more. Here's one of our favorites, featuring third graders at the Katherine Smith Elementary School in San Jose, CA, designing tiny houses. Our rapidly expanding PBL Project Library holds a collection of more than 60 Gold Standard project ideas, created for a range of grade levels and subject areas. 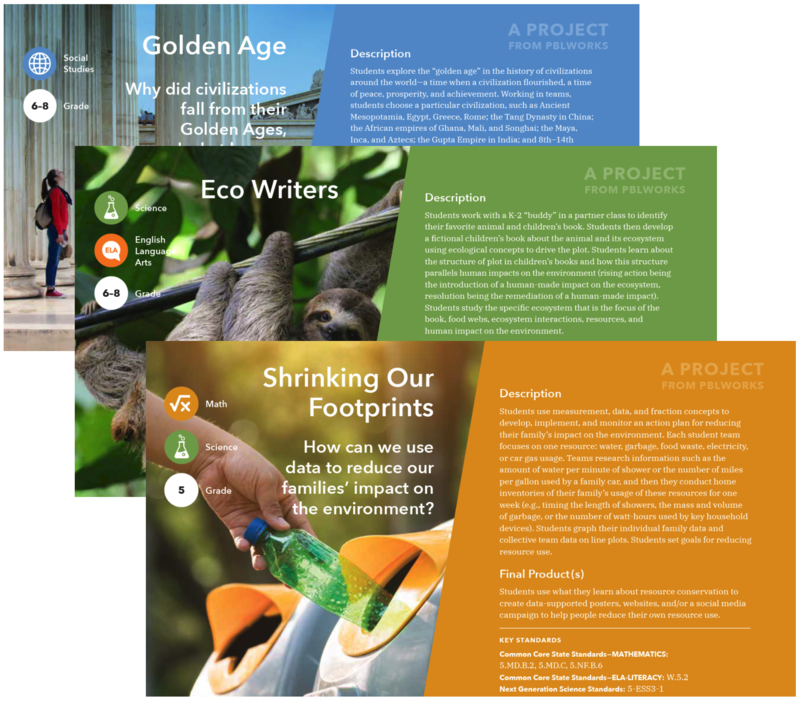 Aligned to Common Core, NGSS, and other national standards, the project cards include driving questions, project descriptions, and recommendations for making products public. Each one offers a great starting point for newbies, and inspiration for more experienced practitioners. Free PBL-related goodies, anyone? We have planning forms, rubrics, student handouts, and more for you to download. Some are created by PBLWorks, and others are collected from fellow PBL enthusiasts. Don’t just take our word for it. Hear firsthand from the teachers, school leaders, students, and parents who’ve seen Project Based Learning in action, in our collection of Stories and Testimonials. Or read our PBL Blog, where we share more stories, projects, and practical advice. BONUS: Talk to our team! This probably goes without saying, but we’d love to hear from you, and answer any questions you may have. Please reach out to us any time.